There was a sharp jump in total production last fall - October and Novermber particularly - but then it tentatively looks like it's been rather flat since December (subject to confirmation by further data and revisions). However, overall the world is at the highest level of liquid fuel ever (ie peak liquid fuel on a monthly basis is still not in the past). Here the C&C is on the right scale, while all the rest are on the left scale (so we can see the changes more easily). The two scales are shifted, but the units are the same size visually (so equal sized absolute changes all look the same). 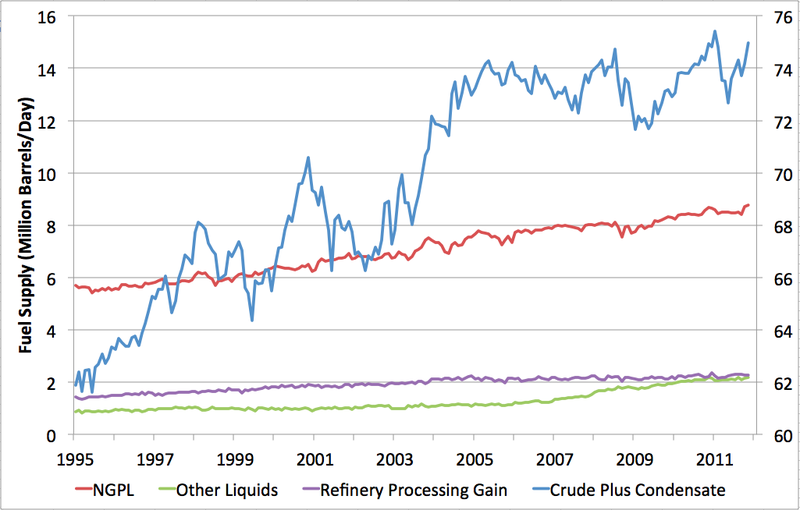 It looks like the gain last fall was mostly coming from the C&C line, with some assist from natural gas liquids. However, C&C has not yet recovered to the pre-Libya level. The EIA has posted the December 2011 oil supply data. December world C+C is a new high, 75,384 kb/d. The average for 2011 is 73,966 kb/d, also a new high, unless revised later. 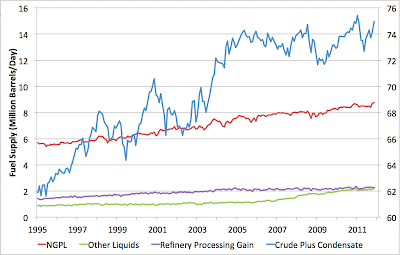 Interestingly, non-OPEC C+C is still down by 429 kb/d from the peak of 43,007 kb/d in November 2010. December oil is also at a new high, 88,764 kb/d. 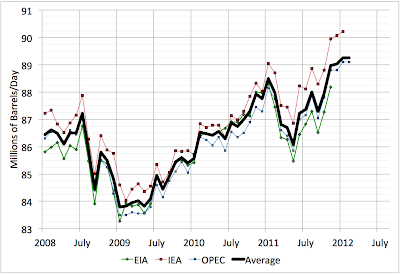 Non-OPEC oil supply is 52,488 kb/d, down 19 kb/d from the previous high in Nov 2010. The previous set of identity characters were tooooo tricky. I took 4 tries to find one that I thought I knew. 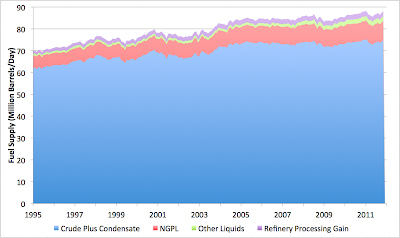 Do we get significant condensates from the natural gas supplies obtained from fracking? From the very nature of how they are stored in the ground, I wouldn't think so, but I am not in the hydrocarbon industry. 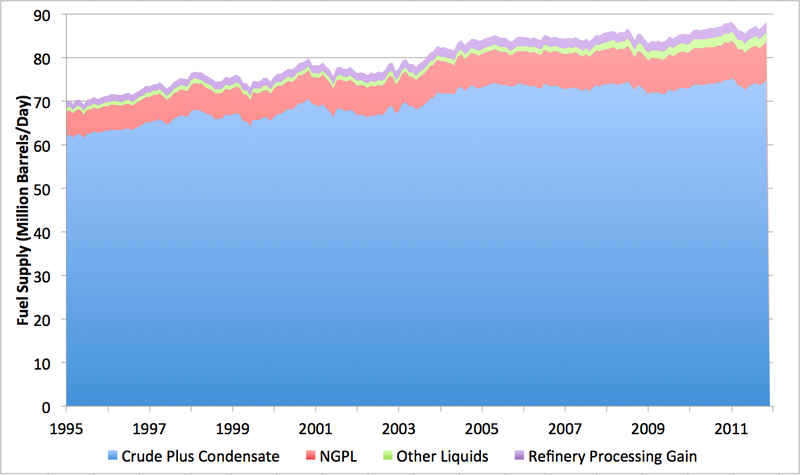 We have an increase in condensate supply, so where does it come from? I'm pretty sure the most significant supplies of natural gas left on the planet (besides methane hydrates of course) are in Russia, with a lesser amount in Iran. Is there where the increase is coming? Or other areas?